Danny Trejo was born on May 16, 1944 in Echo Park, Los Angeles, California, USA. His mother is Alice Rivera, and his father is Dan Trejo, a construction worker. Danny and filmmaker Robert Rodriguez realized that they were second cousins during the filming of Desperado in 1994. Danny's heritage is from Mexican descent. He is an American actor whose real name is Dan Trejo. He is also known as Daniel Trejo and Denni Trekho. His nickname is The Mayor. 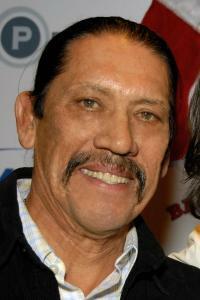 He is 5' 6" (1.68 m) and has three children, Danny Boy Trejo (1981), Gilbert Trejo (1988) and Danielle Trejo born in 1990. He married Debbie Shreve on December 12, 1997 and divorced her in 2009. He lives nearby his mother and is very close to her. He became a champion boxer in lightweight and welterweight divisions while serving five years in prison. He has served time in Tracy prison from 1963 to 1965, San Quentin prison from 1965 to 1968 and Soledad prison from 1968 to 1969. He was in prison for armed robbery and drug offenses. During his time in prison, he became a member in a twelve-step rehabilitation program that helped him to quit his drug addiction. After his release from prison, he attended Pitzer College in Claremont, California for one semester and then quit. His big break occurred in 1985 at a Cocaine Anonymous recovery meeting that helped him to stay sober. He met an old man that was in the movie business at a recovery meeting in Los Angeles. The old man asked Danny to meet him at the filming set of Runaway Train. He worked as an extra in the prison scene of the movie. Edward Bunker saw Danny and immediately remembered him from San Quentin prison where both of them served time. Edward was an ex-convict and crime author that was writing the screenplay for Runaway Train. Edward then offered Danny a job to train Eric Roberts for a boxing scene that will pay him $350 a day. Director Andrei Konchalovsky liked Danny and offered him a role as a boxer. He said in 2011 that he was 42 years sober. He has acted in over 280-movies/television shows and video games. He is also the producer of 11 movies. He usually does four films every year since the 1990s, but he was in nine movies in 2002. He is mostly known for playing characters that are hyper-masculine, villains and heroes. He has a heavily lined face, mustache, deep voice, scars from cystic acne and from being in a brawl. Some movies that he is known for are Heat (1995), Desperado (1995), Con Air (1997), From Dusk Till Dawn (1996), Spy Kids (2001, 2002, 2003, 2011), Machete (2010) and Machete Kills (2013). Champion is a 2005 movie that is based on a true story of Danny Trejo. All the actors in Champion play as themselves. He has appeared in video games such as The Fight: Lights Out, Call of Duty: Black Ops and Call of the Dead. He is the only actor to appear in all three of From Dusk Till Dawn movies in the franchise. He said his favorite films were The Searchers (1956), Once Upon a Time in the West (1968), Dirty Harry (1971), Death Wish (1974) and Animal Factory (2000).